Can DUI Checkpoints Change Perceptions of the Police? New Year’s Eve is near, and police will be especially vigilant about pulling over drivers they suspect of being drunk. While traffic stops pop up more frequently around holidays, they actually represent the most common interaction that people have with police and highway patrol officers on any given day of the year. The US Department of Justice reports that in 2011, 86% of people’s most recent contact with the police was during a traffic stop. And a disproportionate number of those pulled over and searched were black, contributing to the public perception of racial bias within law enforcement. Too often these routine interactions between police and the public spiral out of control: According to the Justice Department report, 6% of drivers pulled over in traffic stops in 2011 experienced some type of police force used against them, from shouting and cursing, to verbal threats of force or other action, to physical force, including hitting, handcuffing, and pointing a gun. These incidents can even lead to tragedy, like last summer’s fatal shooting of an unarmed black man by a University of Cincinnati police officer during a traffic stop. The death of Samuel Dubose is one of many incidents that have compromised public trust in American policing, spawning protests and community activism across the United States. But there are specific practices that police can adopt to improve public trust and cooperation, according to a new report authored by psychological scientists Tom Tyler (Yale Law School), Phillip Goff (University of California, Los Angeles) and Robert MacCoun (Stanford Law School). In the report, published in the journal Psychological Science in the Public Interest, Tyler, Goff, and MacCoun review the available scientific research on the relationship between public perceptions of legitimacy, trust, and law-related behavior. The best way for police to cultivate legitimacy in the eyes of the public, the researchers argue, is to treat people with respect and fairness in the line of duty. Tyler recently collaborated with police in Queensland, Australia to demonstrate the effectiveness of applying these practices in traffic stops. Tyler and University of Queensland behavioral scientists Lorraine Mazerolle, Emma Antrobus, and Sarah Bennett analyzed data they collected from 60 drunk driving checkpoints across Queensland. In a “business-as-usual” control condition, police tested drivers for alcohol as they normally would. In the experimental condition, police were trained in incorporating procedural fairness into their routine stops. Police in the procedural fairness condition were given scripts for the traffic stop, emphasizing four components of fostering procedural justice: Officers asked motorists for input on police priorities (voice); they explained that people were randomly stopped and had not necessarily done anything wrong (neutrality) and that their actions were motivated by a desire to keep people safe (trustworthy motivation); and the officers were asked to find some way to communicate respect for the people they dealt with—for example, by thanking them for their cooperation. An officer provided each driver with a packet containing a survey. The survey asked drivers to rate the quality of their interaction with the police, willingness to cooperate with the police, and trust of the police. Surveys from 2,746 drivers were analyzed. Even though these encounters lasted under 5 minutes, they influenced people’s views about the police in their community. “Not only did citizens feel well treated by the police during the experimental encounter, but these positive encounters also engendered more positive feelings about the police in general,” Mazerolle and colleagues write in the journal Criminology. Studies like this show that when people view the police as legitimate, they are more likely to comply with directives and cooperate with police – ultimately contributing to a safer community for everyone. 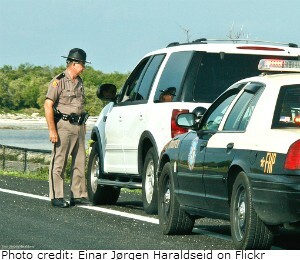 News > Minds on the Road > Can DUI Checkpoints Change Perceptions of the Police?